J.R. Alexander has lived in Kerrville, Texas since 1982. He is a 1989 graduate of Tivy High School. He and his wife Julie have 4 children. J.R. has been in broadcasting since 1996. He was the voice of the Tivy Antlers for the ‘97 and ‘98 seasons before having his own sports show on KVHC TV (Kerrville, TX) for 10 years. 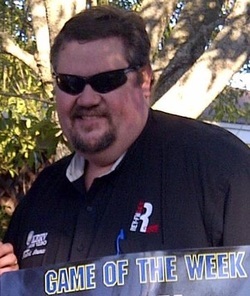 J.R. is the Play by Play Commentator for Hill Country Nation's Game of the Week for Football, Basketball and Baseball/Softball which also can be heard on JAM Broadcasting Radio Stations in Kerrville, TX . Hill Country Nations Game of the Week is currently being aired on FM 103.7 The Buck LIVE on Friday Nights. "Never leave that till tomorrow of which you can do today." "You gotta hold your water Boys!"